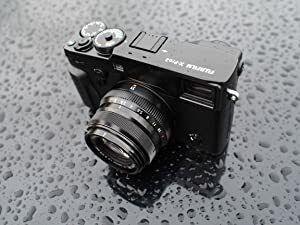 Worthy success to the popular X-pro1 interchangeable LENs camera, the Fuji XPro2 starts up faster, gets ready faster, focuses faster, processes larger images with optional compression faster, and writes to SD cards faster (as well as two memory slots). The Fuji XPro2 features new 24MP X-Trans CMOS III image sensor and high performance X Processor Pro image processing engine, advanced Hybrid Viewfinder, Fast focal plane shutter, intelligent Hybrid Phase detection, and ergonomic weather resistant rugged body. 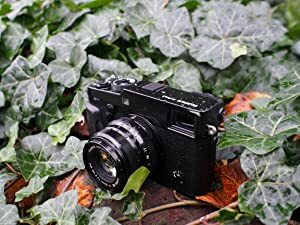 By combining these features with FUJINON XF lenses and FUJIFILM's renowned colour reproduction technology, the Fuji XPro2 camera delivers the best ever results from a Fujifilm camera. - The X-Pro2 features the 24.3 MP X-Trans CMOS III sensor that uses a unique random colour filter array to reduce moiré and false colours without the need for an optical low-pass filter (OLPF). By eliminating the OLPF the resolving power of FUJINON lenses is maximized to deliver images comparable to a larger, higher resolution sensor. - Fujifilm’s colour reproduction technology, developed through over 80 years of producing photographic film, delivers beautiful colours just as you remember them, including warm skin tones, clear blue skies, and the vivid greens of foliage. - The X-Pro2 features the ACROS Film Simulation mode. Harnessing the high processing performance of the X Processor Pro, this mode produces smooth tones, deep blacks and rich textures that are far superior to conventional monochrome modes. - Improved noise reduction has been made possible by an improvement in signal processing technology. High ISO sensitivity performance has also been improved to the point that the whole sensitivity range – up to the maximum ISO 12,800 in RAW – can now be used with confidence. Even the higher settings - up to ISO 51,200, there are smoother gradations and deeper blacks, vastly increasing low light shooting options. - An improved electric charge transfer rate and algorithm means ultra-fast readout speeds are possible. This has led to a significant improvement in functions including AF speed and continuous shooting performance. - By using compressed RAW files, performance and functionality now meets the needs of professional photographers, including faster live view and even higher definition movies. - The EVF uses an LCD with 2.36 million dots. The display speed has been improved from the 54 fps of the previous model to a maximum speed of 85 fps, which substantially reduces the image delay phenomenon when tracking a moving subject. Blackout time after release has also been reduced by approximately half, to 150 ms, so it’s comparable to an optical viewfinder. - The optical viewfinder’s design is based on the proven system from the X-Pro1. It incorporates a diopter correction mechanism and has a longer eye point of 16 mm so the finder is easier to see through. In addition, the telephoto bright frame has been enlarged from a focal length of 60 mm to 140 mm, further enhancing practicality and convenience. - The X-Pro2 features an Electronic Rangefinder (ERF) mode that was highly rated on the X100 series. It displays a small electronic viewfinder on top of the optical viewfinder, which can be used to check focus, the angle-of-view, exposure and white balance in real-time, even when taking photos through the OVF. - Approximately 40 per cent of the imaging area is now covered by fast, precise phase detection AF pixels, which means focusing speeds when photographing moving subjects have improved dramatically. By combining the processing capabilities of the X Processor Pro with a contrast AF readout speed that’s 2x faster than before, the X-Pro2 delivers the fastest AF performance ever in an X-Series camera. - By improving the predictive AF algorithm and increasing the accuracy of the phase detection AF information continuous shooting at up to 8.0 fps is possible. The body is made from rigid magnesium alloy and has seals in approximately 61 places making it splash and dust resistant. It will also continue to operate in temperatures as low as -10 degree Celsius so it can be used almost anywhere without having to worry about the conditions. - It features the same semi-gloss black finish as the X-Pro1. This finish can only be added after a thorough polishing and adds a luxurious touch that will please câmera enthusiasts. - The focal plane shutter boasts a top speed of 1/8000 sec., flash sync at up to 1/250sec and shutter durability of 150,000 shots, making it both versatile and reliable.